The recent flap over Arkane/Bethesda/Zenimax taking over Prey 2 and possibly turning it into a "spiritual successor" to the original System Shock computer game by Looking Glass got me thinking: why does this matter? What is it about System Shock that makes this news important? 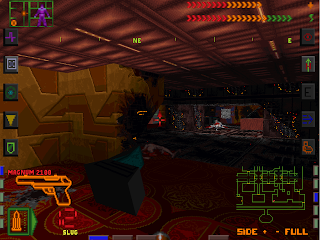 System Shock, along with Ultima Underworld and Thief (by Looking Glass) and culminating in Deus Ex (by Ion Storm), represented what I believe was a critical branch in the evolutionary tree of computer games. This branch of games took full advantage of the RAM in the PCs of the day to create worlds -- they simulated places filled with things expressing relatively complex interacting behaviors. What this meant was that it was possible to create game worlds in which the environment itself allowed multiple viable solutions to gameplay challenges. The world of the game enabled different kinds of players to solve challenges in ways that satisfied their preferred play styles. Whether you prefer action, or conversation, or stealth, or exploration, the thing that distinguishes a Looking Glass-style game from others is that many or all those play style preferences are supported. The focus was on you, the player, and how you like to have fun. That way of thinking about how to design computer games changed drastically after the emergence of the PlayStation and Xbox. Games after 2000 -- perhaps because of the RAM limits on the new (not-PC) primary target platforms -- started to sharply limit what the player could do. The gameworld got a little prettier but much shallower. You were given one path to follow and not much problem-solving freedom beyond one or two ways to just destroy everything along that linear path. Modern games have taken away much of your creative liberty in an attempt to guarantee that you always know exactly what you're supposed to do next, and that you never need to introspect about how to do it because there's only one way available. We got fewer games encouraging real interactivity with a dynamic world, and more games consisting of a developer-dictated (and frequently overblown) story punctuated by long theatrical cutscenes. The player-focused System Shock was eventually stripped down to the showy and literally "on rails" BioShock: Infinite, and probably was the Marketing-driven source for the painfully dumbed-down Dead Space. In short, AAA computer games became moderately interactive big-budget movies. ...but it was never the only valid playstyle. The only thing wrong with the shift to action games was that the gamers who do enjoy conversation and stealth and exploration -- solving problems by thinking and feeling -- got fewer and fewer of the games that they could enjoy. There certainly wasn't much publisher support for making Looking Glass-type games that were designed to support and reward multiple play styles! Beyond Bethesda's open-world Elder Scrolls and Fallout games, and the occasional throwback (STALKER), the evolutionary branch of games implemented as systems generating emergent behaviors seemed to die out. And that was a huge loss to the whole game industry (and gamers) for the important reason that these games used the full power of the computer. An interactive movie is an extended cutscene in which you have a little low-level freedom to make some tactical gameplay choices that won't affect the plot of the movie that the developer has decided you're to experience. The consoles have had just enough power to run games like that. A true computer game is one that harnesses the power of the general-purpose computer to simulate a world, and then let you solve playful challenges in that world in your own way. We need developers who will make more games in the Looking Glass style because those are the products that will distinguish computer games from different/older forms of entertainment such as movies. If computer games are ever going to be their own unique art form, they cannot just copy movies and slap a coat of mildly interactive paint on them. They need to use the full simulationist power of a real computer to create new worlds and unleash the creativity of players to interact in deeply human ways with those worlds. It is important that Arkane/Bethesda/Zenimax appear to be ready to make a true spiritual successor to a Looking Glass game like System Shock because making player-centric games is the healthiest course for the whole computer game industry. This is the kind of game that, as other developers follow, will keep the industry alive by giving it its own identity apart from movies. Computer games that are highly responsive environments are something only computers can do. They are what computer games should be. I hope Arkane can get past their self-inflicted PR wounds. I hope the next game from Arkane Austin really is the first of many true spiritual successors to System Shock and the other Looking Glass-style games. Games that use the power of the computer to simulate dynamic worlds and free players to enjoy their own kind of fun in those worlds will save the game industry. Interactive movies won't.